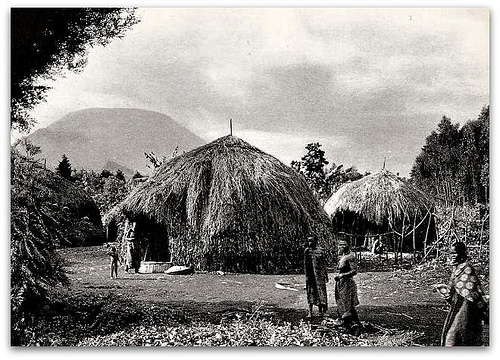 As a follow up to Monday’s post on the Rwandan palaces, here are two photos of ordinary villagers’ homes from about 1950. I believe they are of the same village north of Lake Kivu near the Congo-Rwanda border. 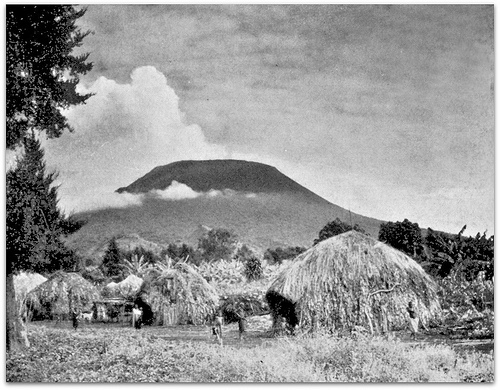 View of the volcano Nyirangongo in the 1950s, from Guide touristique du voyageur, 1958 edition. (collection Gilbert Delapierre). Village at the foot of Nyiragongo, about 1950 (collection Pierre Gallez, carte postale). Great photos! Do you know if the doors are all pointing the same way for climatic or privacy or other reasons? I had not really noticed that. The two little “keepers” houses were in their own enclosures within the larger enclosure. They were behind the king’s house. I suppose they were placed so that no one would turn his or her back to the king. The keeper of the king’s milk was always a woman, a virgin, who never left her little compound. How long she remained a keeper was up to the king’s mother. It was the same with the keeper of the king’s beer, but a man took the position. Beer was made from either bananas, honey, or sorghum. It was drunk from a clay pot through a straw. The homes were lit by a brazier in the middle area. The smoke could only go out the front door, so it must have been smoky inside. That was also the only light. Boys of the house slept near the front door, the girls slept in the furthest back area. The king slept in a large raised bed covered by barkcloth. He entered the bed from a decorated entry off the center area of the house. The queen entered the bed from an opening off the back area of the house. Oh, I’m sorry, I was replying about the king’s palace post on Monday. I imagine those above could have been facing the same way so they they face an open area or main path. It’s also possible that it could have been rude to turn your house’s “back” to another house. I will do a little research and report back if I can find out.